Twenty-plus miles of clear water, easy rapids and tight bends provide ample adventure, solitude and beauty in northern Wisconsin. Healthy and clean, the Eau Claire offers good swimming on hot days and a mile or two of abuse, which highlights how unspoiled most of the river remains. There is no gauge but it was suggested by a local resident that the Leonards Bridge gauge on the Namekagon River might correlate pretty well. The day we paddled the Eau Claire, there hadn’t been much rain for a couple weeks and that gauge was at about 1.8’ but the river is fed by three spring-fed lakes, which were brimming over from the summer’s earlier monsoon. Our theory is that it remains floatable most of the year, unlike a lot of similar rivers in this part of the country, thanks to those bubbling springs (we have a lot of theories). Time: Put in at 8:00a. Out at 6:00p. Wildlife: Green heron, fish, a deer and a bald eagle. This was the smallest river I’ve ever paddled. Not twenty feet across in many places and wadeable nearly its whole length, I liked that it still floated our 18-foot Grumman canoe down its length. We banged a few rocks and hung up in a couple spots but never had to get out and drag and it was all worth it for the closeness of the scenery. This felt like a truly northern river. The forest was pine and fir and spruce, or beaver-beloved bogs of alders and willows. And the land, sculpted by glaciers. It joins the St. Croix farther north than any other tributary (other rivers extend farther north in Minnesota but join the St. Croix farther south) and cuts through sparsely-populated country near the edge of the St. Croix/Lake Superior watersheds. Not surprisingly to anyone who knows the French translation, the water is clear as glass. Being able to see the bottom effectively doubles the scenery on a river, adding to the beauty on the banks. There were fish, including big redhorse sucker, a two-foot northern pike, maybe a couple trout and logs and rocks and sand and bright green river plants. I could watch it go by all day everyday and not get bored. One of our party had binoculars around his neck and the plant guide in his lap all day. We saw the most green herons I’ve ever seen, including three at one time and a bald eagle launched out of the brush on the bank next to us at one point, sounding like a deer crashing until it rose on its massive wings right over our heads. We saw Lesser purple fringed orchids and Michigan lilies when we watched the banks carefully. Driving shuttle on County Y, we saw Wood lilies and a few massive white pines tower from the banks. Also spotted was fireweed (thanks to Ryan Rodgers for the eyes and the plant identification). My mom was a high school American history teacher and taught me so I can’t help it, I’m a sucker for history. The Eau Claire is rich in it. The river’s town is Gordon, which got its start as an Ojibwe village called Amik (beaver), located at the confluence of the Eau Claire with the St. Croix, where the historic St. Croix Trail portage crossed, connecting the region to Lake Superior and the big fur trade post at La Pointe on Madeline Island. One local history buff says the trail was more popular than the Brule River route, which didn’t even appear on at least one voyageur’s map, while the St. Croix Trail is prominently featured (thanks to Brian Finstad for sharing all that and much more about Gordon in response to the National Heritage Area proposal for the St. Croix River region). It was hard to imagine but this shallow, winding, narrow river, once carried lumber. In 1893, one company cut logs east of upper Eau Claire Lake and skidded and floated them 161 miles “from the stump to the mills” in Stillwater, an elevation drop of 725 feet, writes local historian and tour guide Dave Thorson. Thanks to the clear water, I saw many logs on the bottom and theorized many were logging leftovers. At least a couple probably were. Most of all, I liked the experience of exploration. We had a decades-old map with some notes about distance and hazards and such but it ultimately raised more questions than it answered. I eventually became fond of its consistent inaccuracy. And yet we survived the trip and it was a good reminder that adventure usually means a little leap into the unknown. Hopefully this detailed report will be encouraging while not stripping the fun from the experience. Afterwards, we had burgers and beers at the Buckhorn in Gordon. You can’t miss it. Gordon MacQuarrie, the writer, conservationist, duck hunter and Milwaukee Journal-Sentinel outdoors editor reportedly liked to stop there after the long drive north from the city when he was finally near his cabin on Middle Eau Claire Lake. They had good specials and good beers, a friendly bartender and the descendant of an owner from the Depression era who told us stories of the town and the country but had never heard of MacQuarrie. There’s also a cool historical museum in Gordon, which is open on the weekends during the summer (which is not when we were there) and probably has some river-related information and artifacts. County campgrounds are located at Mooney Dam and at the flowage (I’d go with Mooney Dam, unsurprisingly). The parts humans have done. Paddling the length of this river in one day presents a stark contrast. For miles, it winds through wild woods and meadows. There are cabins at regular intervals, although in the middle was a nice stretch of a few miles without much sign of humans. There are a few pockets of invasive reed canary grass. Almost always it adjoins man-made structures. As we watched dragonflies resting and mating on slender riverside reeds, I wondered if they can get what they need from reed canary grass. And I wondered what mosquitoes think about that. But overall, the upper stretch was unsullied. Then comes the dam. 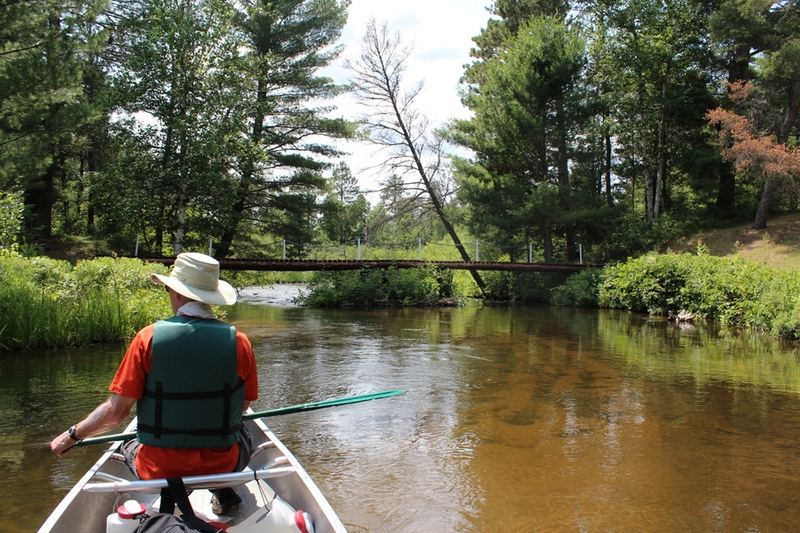 The flowage actually starts right at a bridge that leads to the Gordon Correctional Center. There is a chute with standing waves under the narrow bridge – Ryan went through it twice in his kayak and had a blast. We, in the canoe, portaged around it (briefly experiencing the exhilaration of trespassing on the prison grounds). Below that, the river is neglected at best, abused at worst. The flowage was pretty short and narrow and infested with invasive plants. When we got in sight of the dam, we saw steep, weedy banks and a rusty dam. I expected to find duct tape holding it together (but did not). Our feeble map said to portage left around the dam but of course, that was incorrect. There was nowhere to land, nowhere to climb up the bank and an old fence and piles of detritus on top of the berm on the left side. We checked out the right side and made do with a crummy landing, scrambled up through a thicket and then found no trail but a precipitous, grassy slope down to the river on the other side. I slipped going down with the canoe on my shoulders, suffering no injury and we had to lower the boat down the last 20 sheer feet to the water. One of my companions pointed out it’s all part of the adventure but I thought if people built the dam, people could also maintain a trail around it. We weren’t sure what would await us the last mile, with the flow disrupted by the dam. We didn’t have to wait long to find out. As soon as we were around the first bend we were met with a dead pine all the way across the channel. There was a little gap under it along the left bank and we smashed through, raked by brittle branches. Then there was another tree we were able to get over, and another, and another, every hundred yards. This was going to be a long mile I thought, as I put one foot on a slippery submerged limb and pushed us over another tree. Then we saw a house, with a couple kayaks in the yard. People use the river from here down, it seems and they keep it clear. After that first house, we found no more blockages but saw where several strainers had been sawed off. In this way and this way only, people have improved the paddling experience on the Eau Claire. Though one might want to take out above the dam, it is undeniably fun to slip quietly into the St. Croix, to have paddled the length of a river in one day. The river is grassy here, with cedar waxwings flitting out from bushes and vistas far downstream. There are two railroad trestles and the Highway 53 bridges near each other, so it feels pretty industrial for a few minutes. I will paddle this river many times, I hope. Next time, I might put in at Mooney Dam, where the river proper starts, skipping the lakes but it’s fun going through the hand-operated lock and dam between Middle and Lower Eau Claire Lakes, the Enchanted Inn at the mouth of the river on the lower lake is a pretty sight and a little lake paddling is a nice warm-up. To avoid the prison, the flowage, the dam and the snag-filled channel below it, I would probably take out at South Lawler Bridge Road. We didn’t stop and check out that bridge though and I can’t verify there is good parking or access. I’d scout it when you drop off the shuttle car. Doing Mooney Dam to here will give you an easy day trip and you’ll see the most scenic and unspoiled parts of the Eau Claire. Our big aluminum canoe served us well and I like paddling rivers in a tandem canoe because you get to really work with someone, communicating clearly and acting as one unit (our rambling conversation all day was frequently punctuated by “left” or “right”). That said, I think a kayak is a better fit on the Eau Claire, simply because it’s narrow and twisting and there’s only so tight you can turn a canoe. Some final thoughts: Pulling the canoe up to the bank and swimming in the cold, sandy-bottomed river on a hot July afternoon is a memory I will hold dear this winter. This short, intimate stream contains a great deal of interest – it feels like the kind of river a person might eventually hope to understand as a whole, which is what will bring me back again. The experience of what the river is, what it could be and what people have done to parts of it makes me want to help restore it to its full health and glory. Thanks to Stephen Wilbers for hosting the trip. One of the best parts was seeing where the water at his cabin on Middle Eau Claire goes, something he had not previously had the chance to investigate in 19 years spent at the lake. Greg Seitz is the publisher of St. Croix 360, a community news and river stewardship website serving the St. Croix River watershed. He is a writer and river bum, communications consultant, tall bearded person and a husband and father. Passing through the lock and dam between Middle and Lower Eau Claire Lakes. Enchanted Inn, at the mouth of the river and Lower Eau Claire Lake. Camping and cabins available. This boathouse/cottage is available for seasonal rental, if anyone wants to pay for me to spend a summer there. Starting the river proper below Mooney Dam. Pretty as a prayer book. Dragonflies were abundant. The good folks of the Wisconsin Odonata Society identified this one for me as a Black-shouldered Spinyleg. Lunch break at McCumber Road Bridge. Narrow river, as seen from McCumber Road Bridge. Pilings, we theorized, were remnants of a wing dam from the logging era. Start of the flowage and the neglect. Damn dam, but still impressive. Confluence with the St. Croix. Also, the Upper St. Croix River.